Product #20531 | SKU GPE-10 | 4.0 (based on 1 rating) Thanks for your rating! The GoPole Evo 35.56 to 60.96 cm Floating Extension Pole for GoPro HERO Cameras is a versatile accessory designed for capturing rear-facing and forward-facing 180° footage. 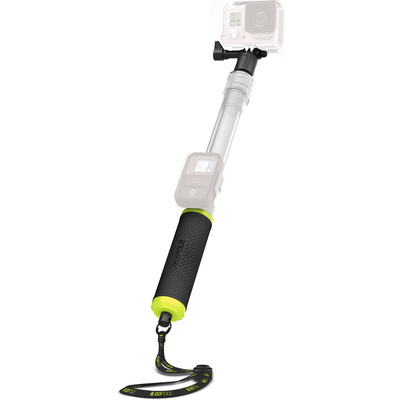 It features a three-prong GoPro mount and a two-stage telescopic design that extends from 35.56 to 60.96 cm. The pole is transparent to help it disappear into the background when filming shots of yourself. Additionally, the pole serves as a flotation device should you happen to drop it in the water. Fantastic tool for action camera user. Keeps your action camera above water (As long as adjustment length is sealed tightly). The pole can get water inside if adjusted under water. I've recommended this product to a family, after I recovered their Gopro in a local bay in Lyttelton. My only issue with the product is that the bolt for the thumb screw is fidgety, but you can easily replace with a cheap 20c bolt from a hardware store.